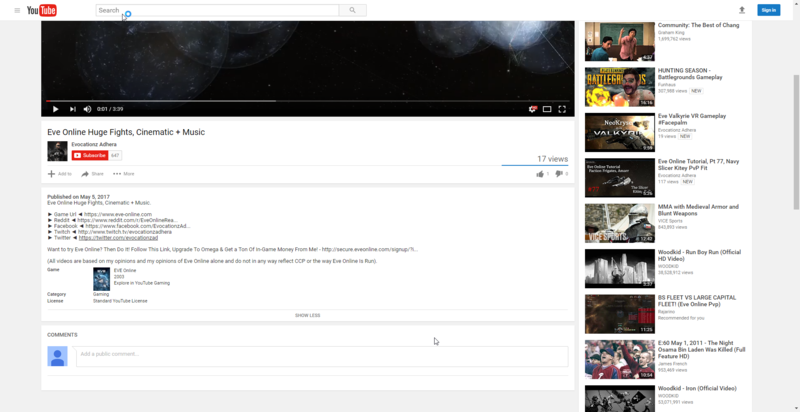 Lmao, what you did is reupload my video onto your own personal channel. Thats not sharing my video, thats pretending its yours. Thanks for deleting it :P Does make me wonder how many other content creators youve ripped off though. Listen, all im saying is that if you really liked my videos youd link my original. What you are doing made it look like you were passing it off as your own, why else REUPLOAD it to your own channel? Actually, regardless of the content that the video contains, you do not have the right to re-upload another person's original video. This is made more serious by the fact that EVE Online allows video content creators to monetize their content, which means someone could make an awesome video hoping to get some ad revenue from it and you could simply steal it for no effort. This is against the rules of YouTube. CCP's video policies has nothing to do with you uploading another person's work.